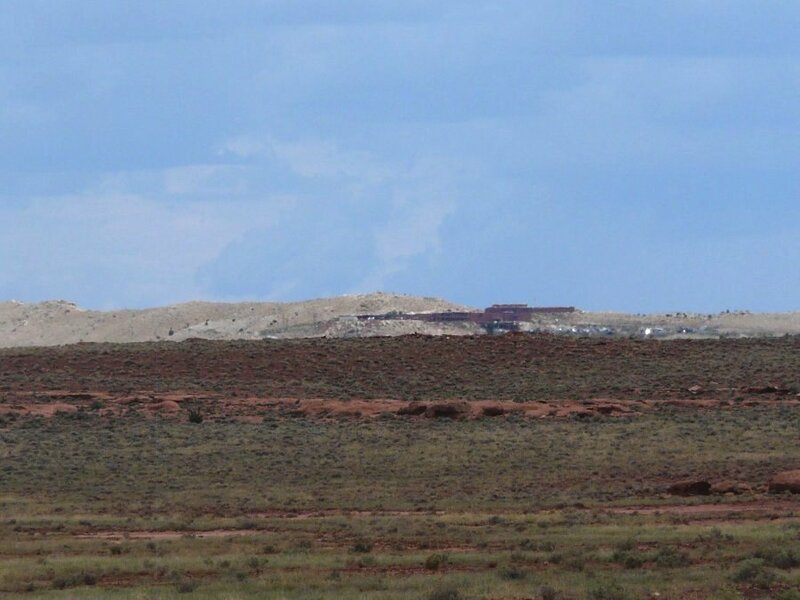 We had a day without monsoon rains so we set out to explore the Meteor Crater 40 miles east of Flagstaff just off I-40. We have passed the road that leads to the crater several times either coming or going and I never stopped because I figured it was just a big hole in the ground. 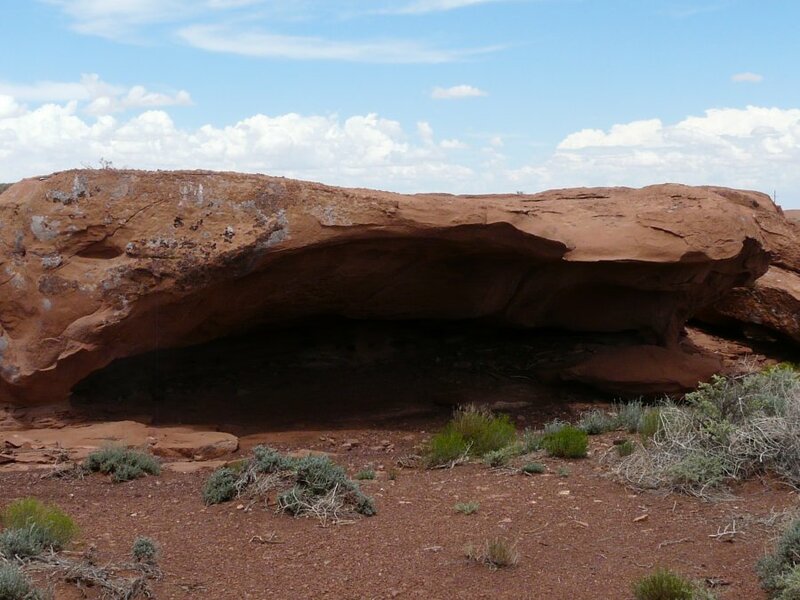 I was right, it's just a big hole in the ground where there is a 5 minute movie promoting their cause (protect the earth from meteor attack) and a guide with a 15 minute tour. Nancy went to the museum while I went on the guided tour. 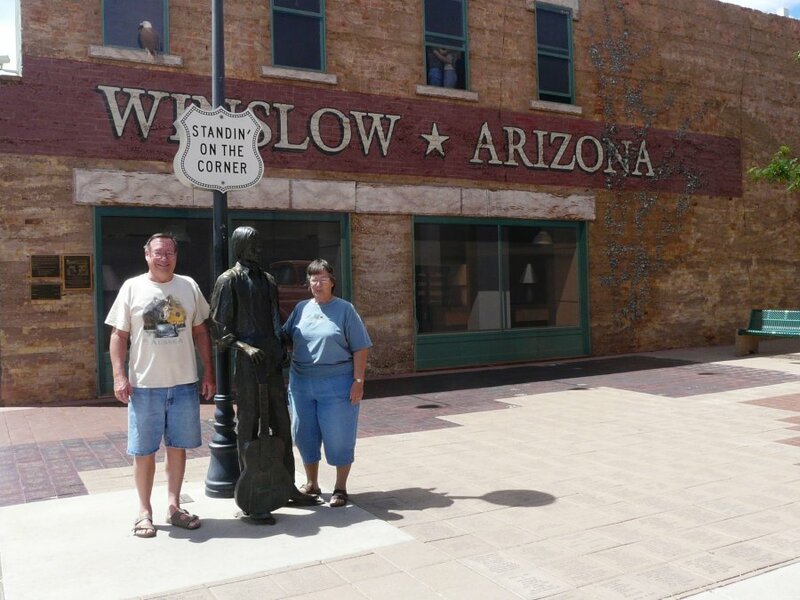 We took a bunch of pictures then moseyed on east on I-40 to Winslow where we stood on the corner and had someone take our picture. Too fun day…. 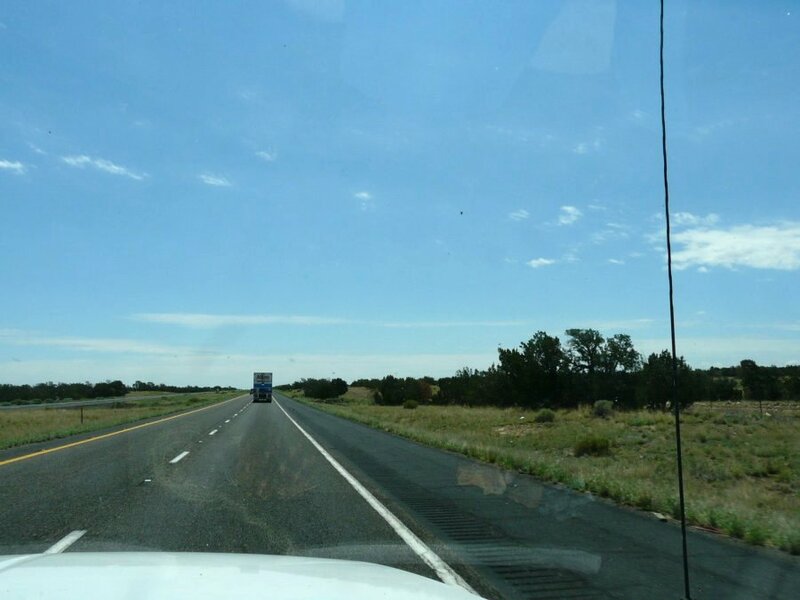 Scooting east on Interstate-40, the tertian has changed from the awesome Ponderosa Pine trees in Flagstaff to sage brush. 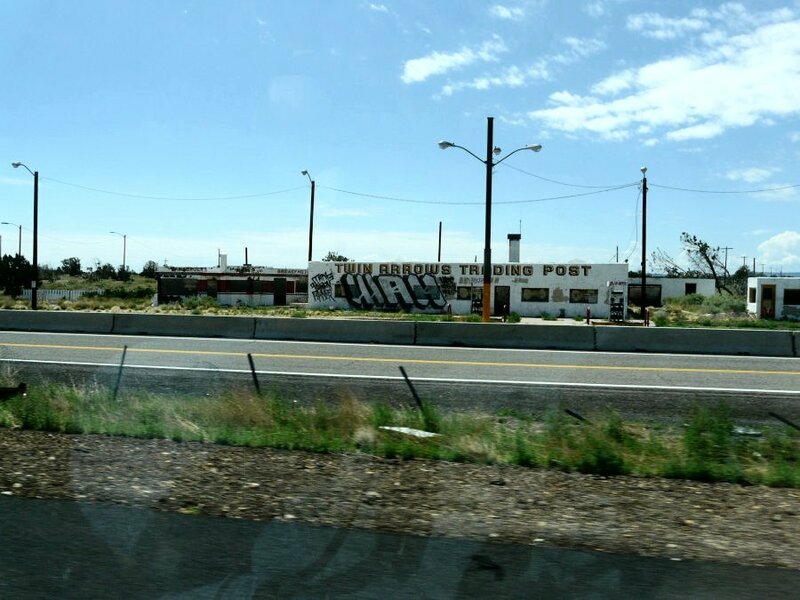 The old Twin Arrows Trading Post with a cafe and gas station was a landmark for as long as I can remember, but now has closed and they have built a new five story casino across the Interstate. 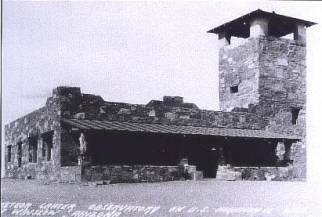 located a few miles east of Winona where old Route 66 started to climb into the wooded foothills. 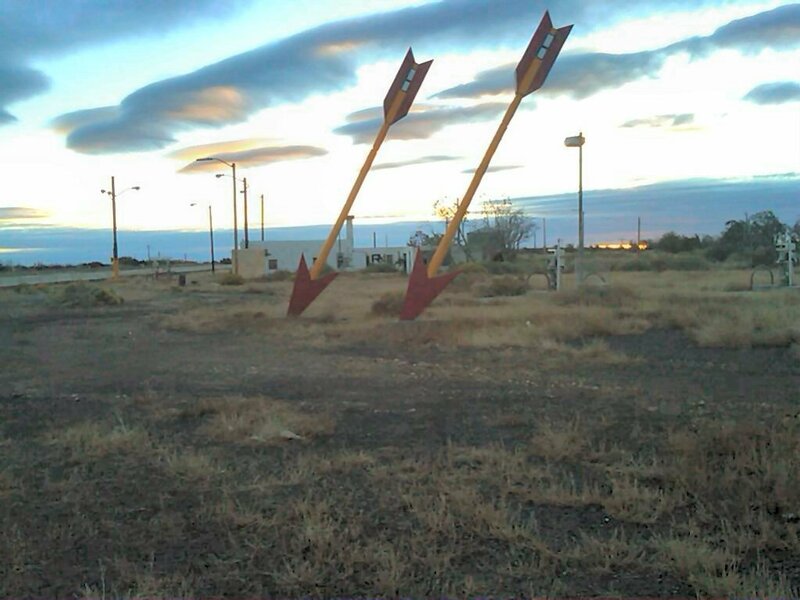 Twin Arrows Trading Post, has closed, with the price of gas frozen at $1.39 a gallon, and the last hamburger sold. 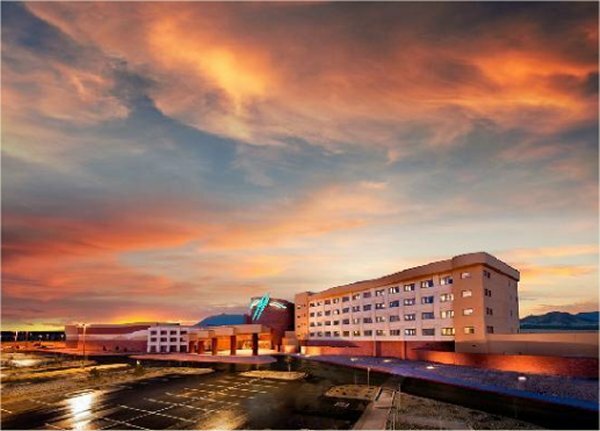 It took five years and $230 million, but Twin Arrows Navajo Resort and Casino opened on Labor Day 2012. They only want $134.00 a night to stay here and gamble you money away. 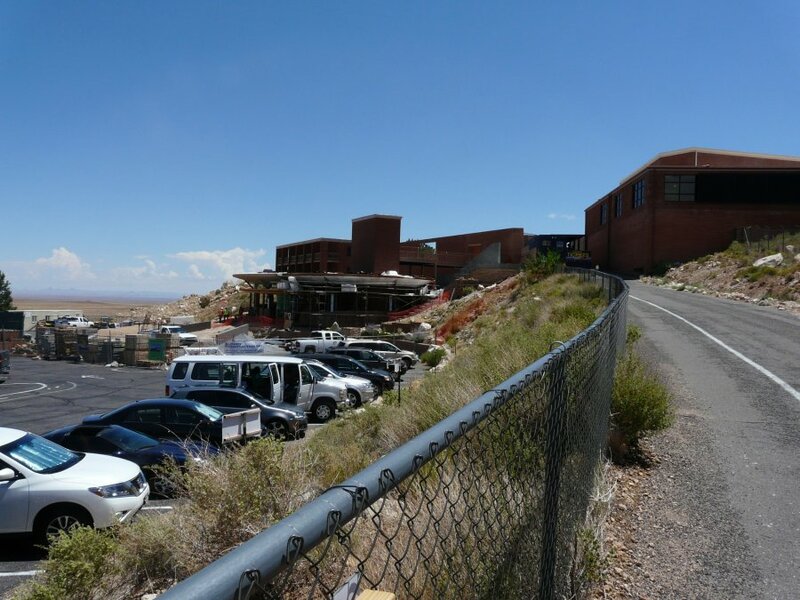 More history.. Meteor Crater Observatory. Built by D.M. Barringer during the hey-day of Route 66, the view from the observation tower was disappointing. 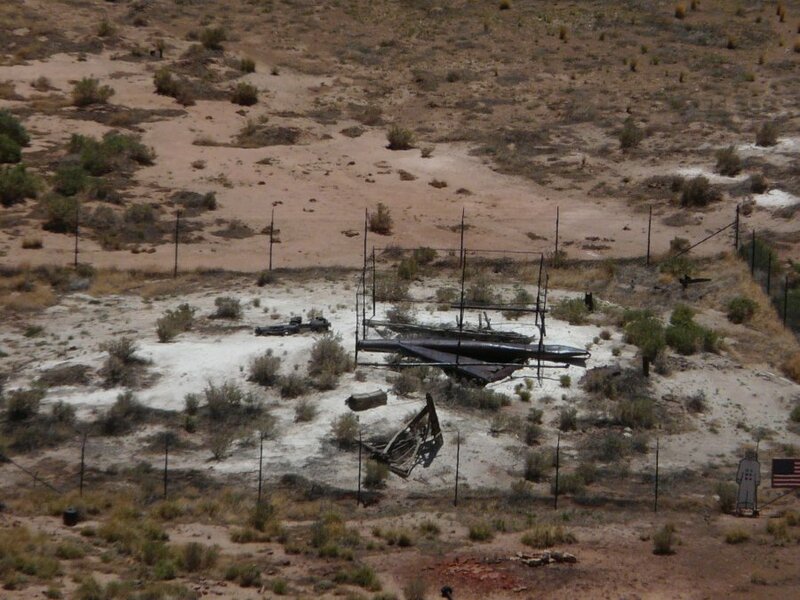 The Observatory was located far from the impact crater on Route 66. 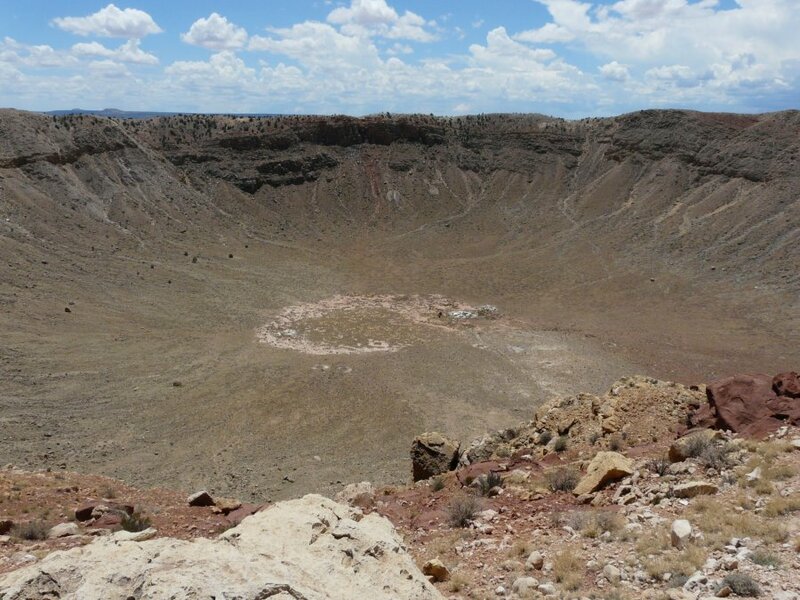 For 25 cents one could view the crater through a telescope, and if the weather was clear - actually see it! 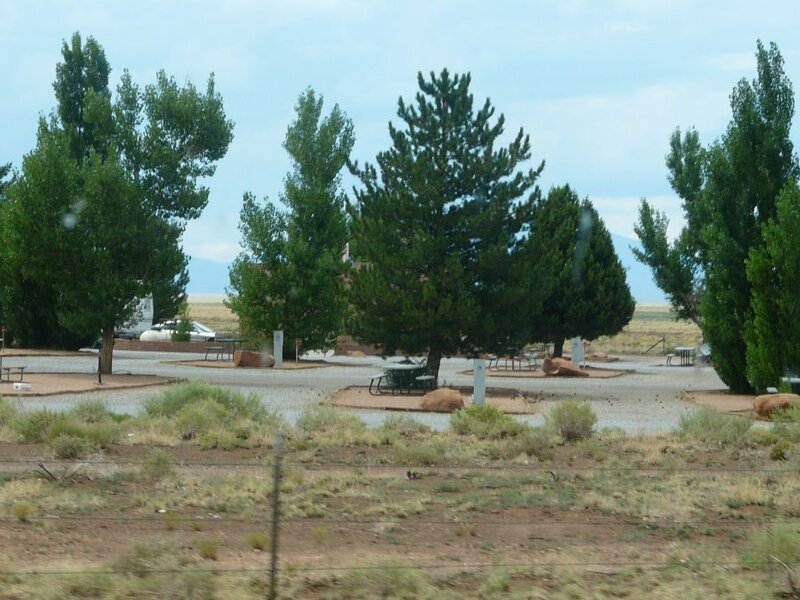 Meteor Crater RV Park located just off I-40 on the road leading to the creater. 71 beautifully landscaped pull through RV and camping spaces and is fully fenced with a secure gated entrance. 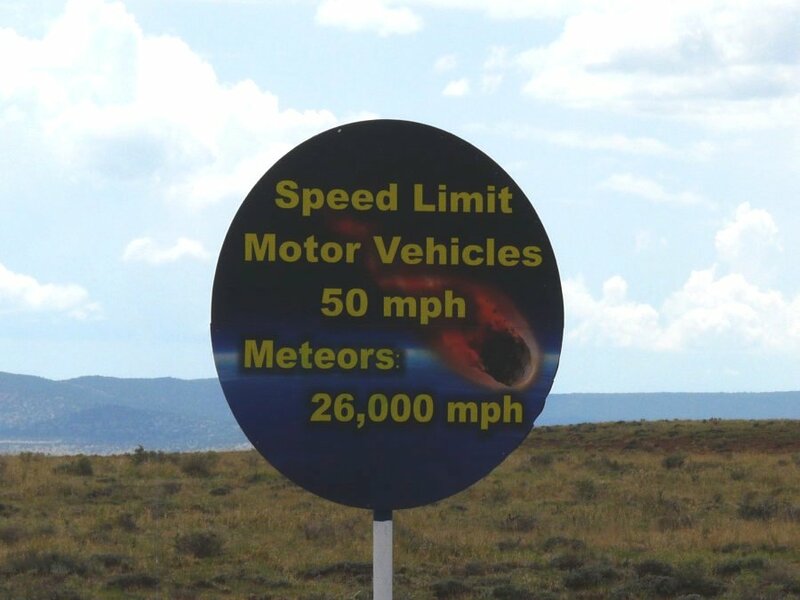 Speed limit sign along the road into the creater. From the parking lot it is all up hill to the visitor center built on the hill when the soil was pushed out when the meteor hit. 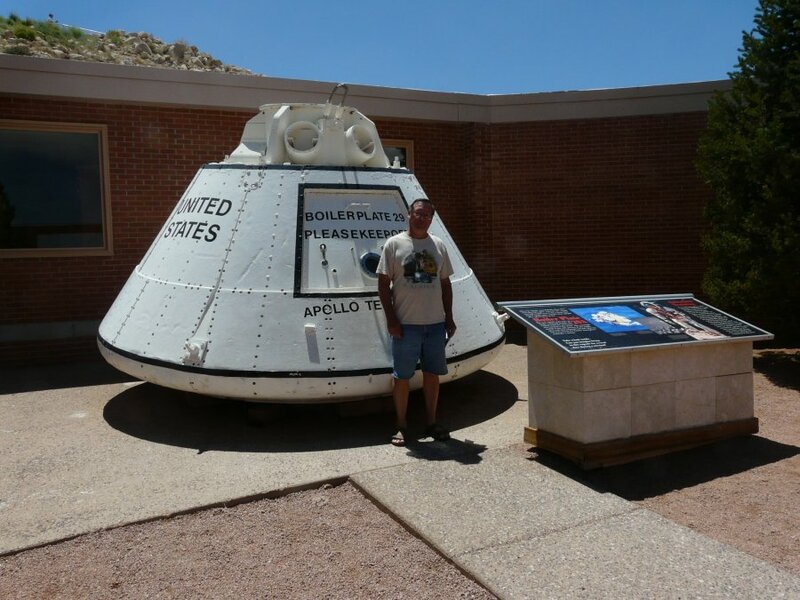 Replica of the Apollo space capsule. 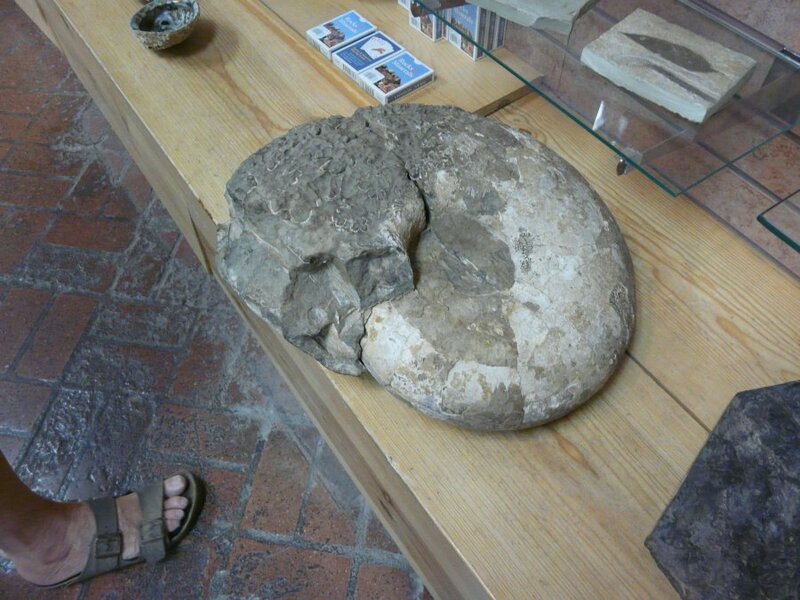 Ammonite in the souvenir shop. 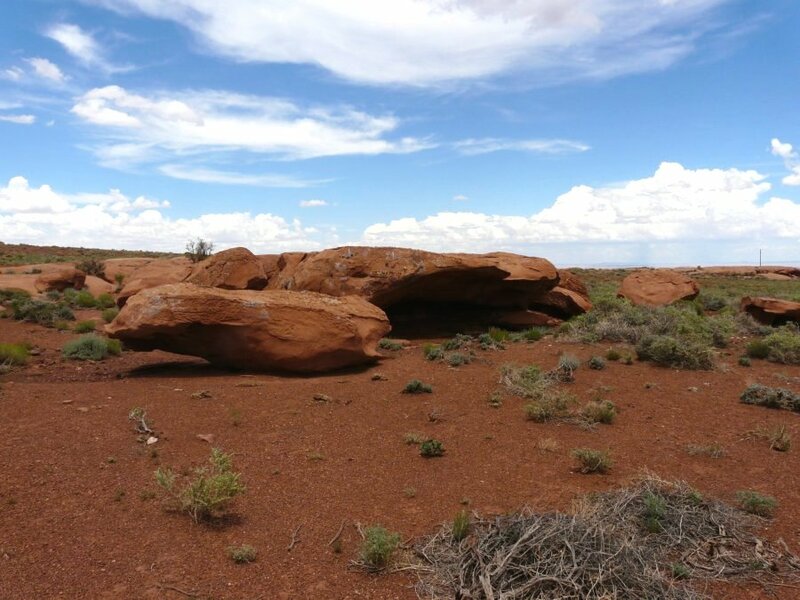 Our tour guide tells us that the meteor that hit here 50 million years ago was about 50 yards across. 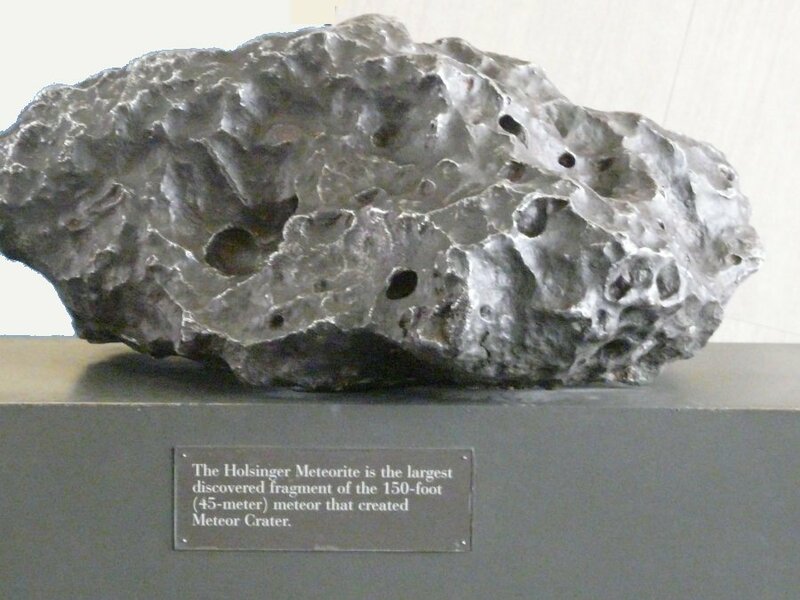 Part of the meteor that hit the crater. 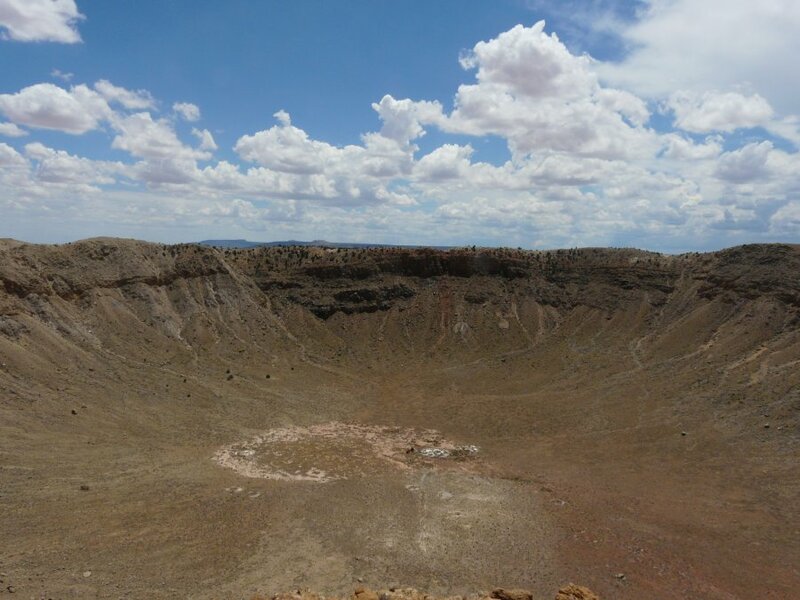 The crater is nearly a mile across and more than 550 feet deep. 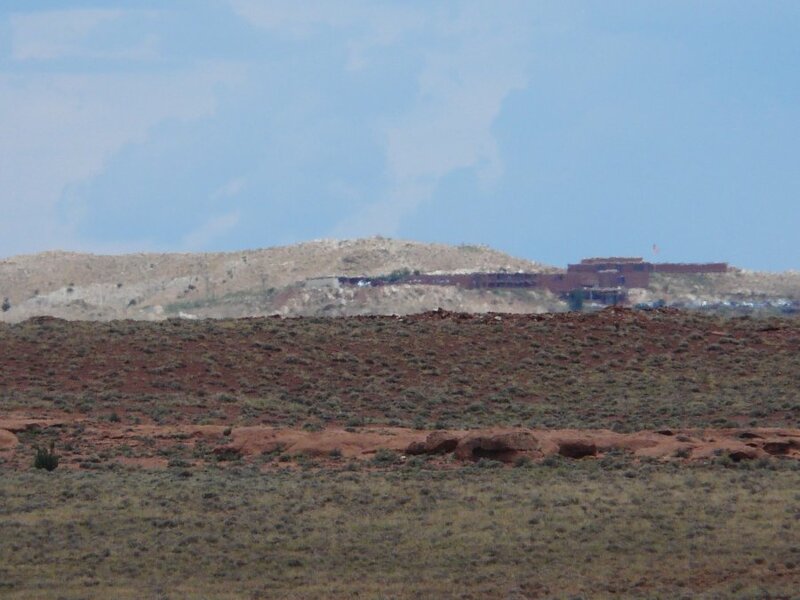 There is an old mine shaft at the bottom. 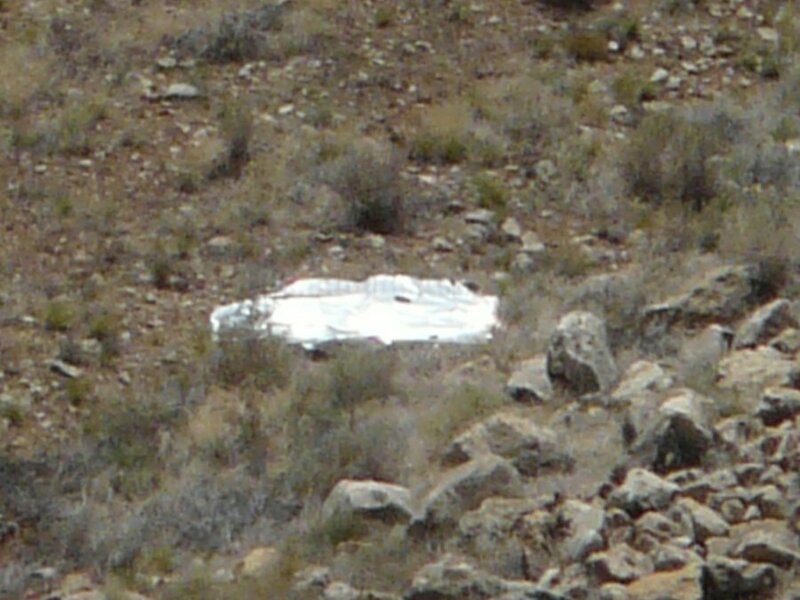 Zoomed in on the old mine shaft at the bottom. 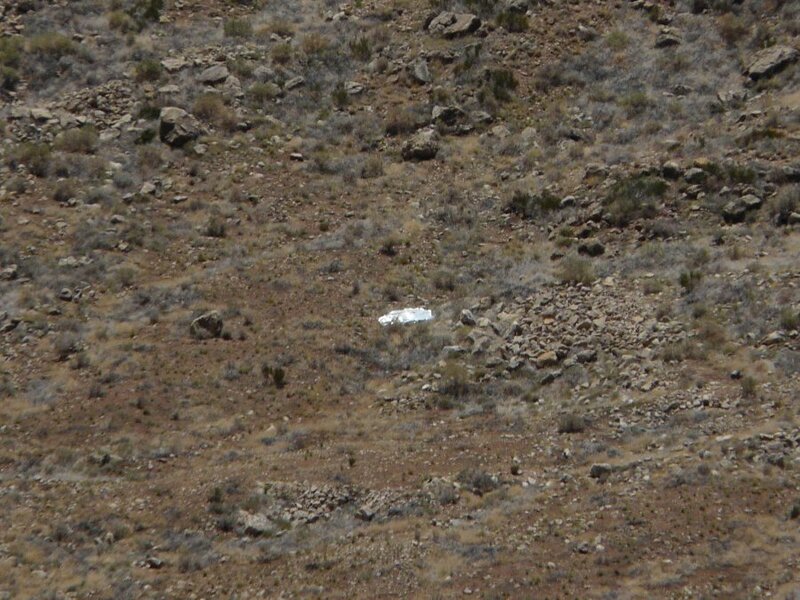 Parts of a small air plane that crashed while joy riding down into the crater. The guide said the parts are from the tail of the air plane. 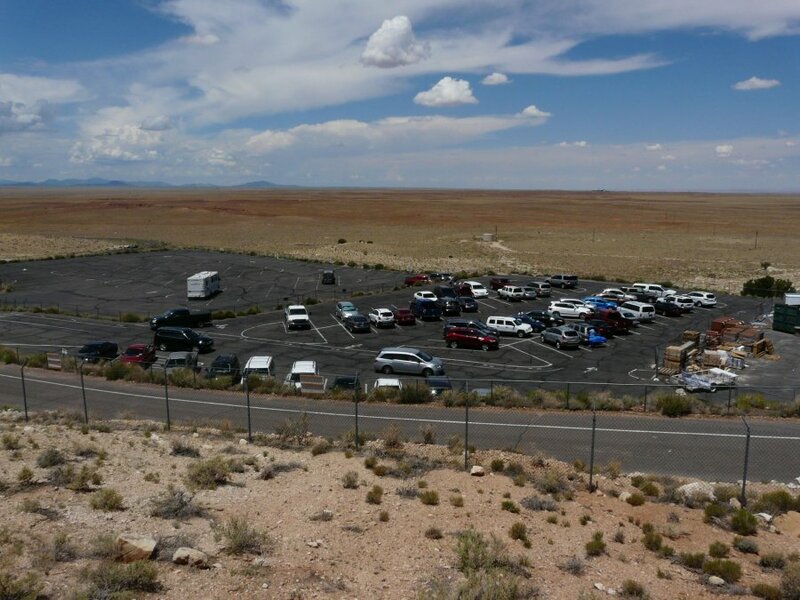 Parking lot and the desert beyond. I took three pictures of the crater and put them together. On the road back to the Interstate we stopped to take pictures of these awesome bolders. 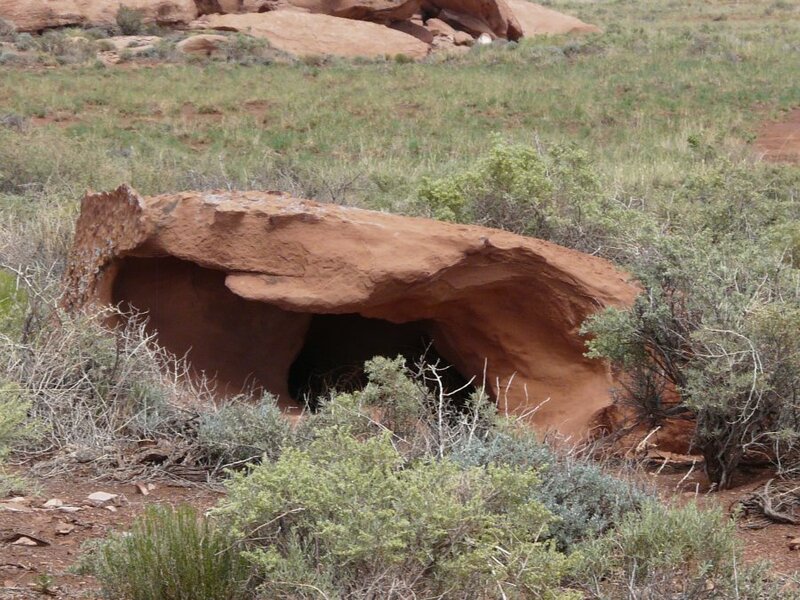 In these two pictures taken miles away from the crater you can see how the earth spewed up and out of the hole. 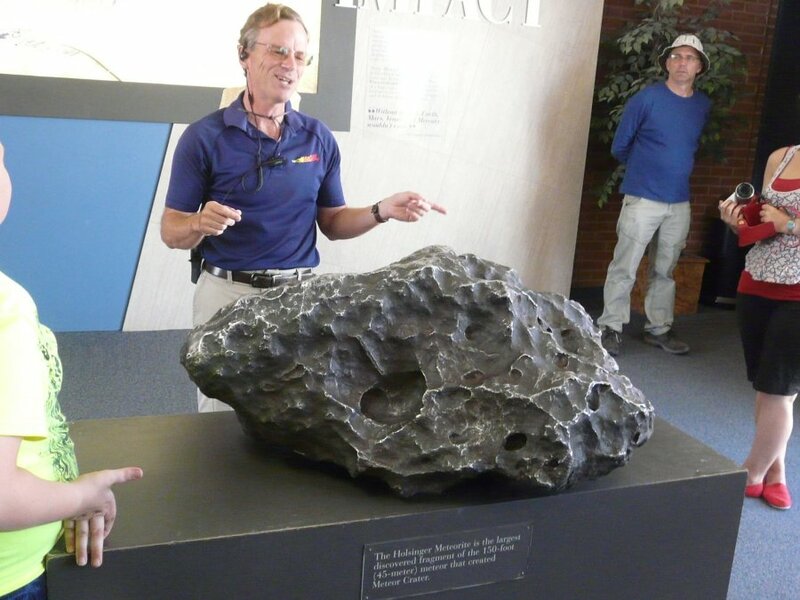 The visitor center sits on top of the pile of earth created by the inpact of the meteor. 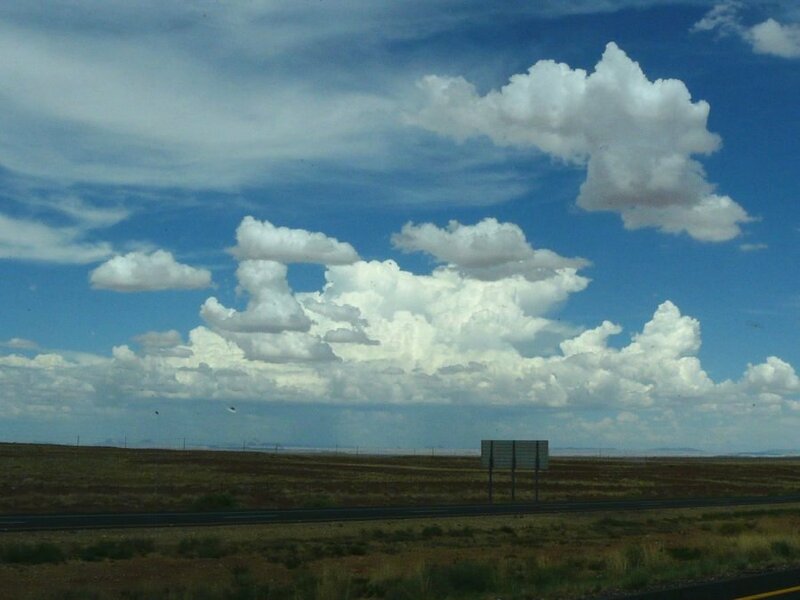 Continue east on I-40 to Winslow, AZ. 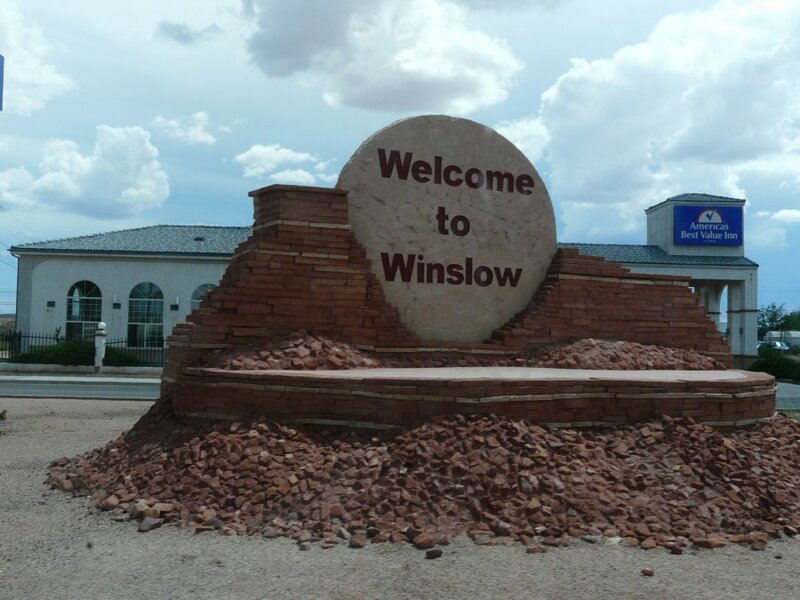 Our friend Jerry sent this picture a week ago when he passed Winslow. 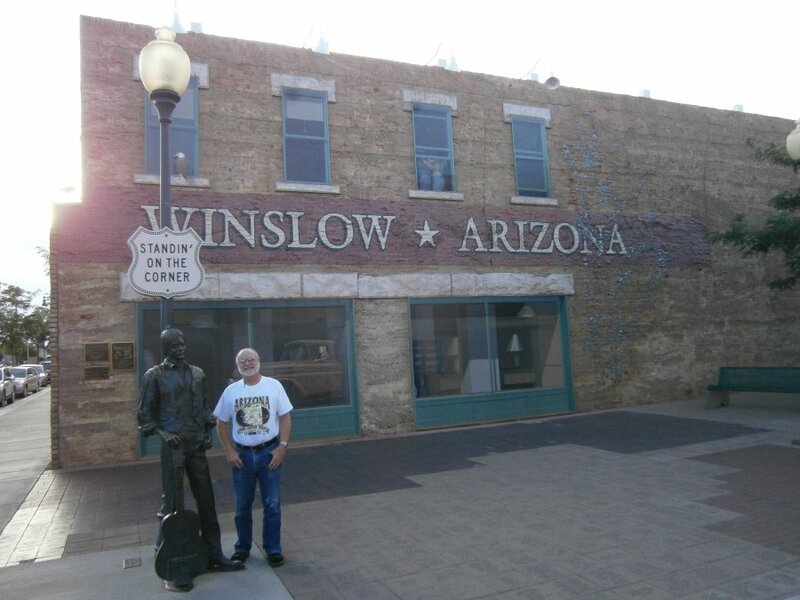 Standing on the corner of Winslow Arizona (song).